We're very excited to share our latest show Uncommon Gems with you! You've heard of diamonds, sapphires, & rubies; and probably know peridots, amethyst, & citrine. But have you heard of ametrine? Ametrine occurs when both amethyst & citrine form at the same time, and occur in the same piece of stone. The result is a beautiful combination of purple & yellow within one stone, each one-of-a-kind! Tourmaline, ametrine, beryl, azurite, sugulite, peitersite, plume agate, fossilized corals, spinel, green aquamarine - we have all these and more! We invite you to spend an evening with us to see new pieces, stone specimen sculptures, and learn about some amazing gems; or speak with one of our artists to design a custom piece from our collection of loose gemstones! All of our gallery artists will be showing new work featuring rare, unusual, and lesser known gemstones. Owner & Artist Kevin Duris will be showcasing new work and classic favorites featuring unusual stones, such as this sterling silver cuff bracelet with amazonite. Amazonite gets its name from the color of the Amazon River in South America, despite the fact that there are no deposits of the stone in that region. Ask to see our loose stones to design a custom Amazonite piece! Petri Kymlander works with many unusual stones, including the yellow beryl found in this pendant. Beryl is one mineral with many varieties that are distinguished by color; emerald & aquamarine being two of the most well-known. Lisa Mele has a stunning collection of rare gem jewelry, including these opal inlay & diamond rings. One of the traditional October birthstones, opal's flashes of color are unparalleled. The majority of opal is mined in Australia, which is where the material in these rings is from. Maxine Rosenthal showcases many unusual stones in each of her pieces, including this beautiful rutilated quartz piece. Rutilated quartz is a transparent quartz that has golden yellow rutile inclusions within. These inclusions can be thin, thick, parallel, crisscrossed, & everything in between. Each stone is entirely unique. Come see our selection of Maxine's piece to pick your favorite, or choose from our loose stones to have something special custom made. 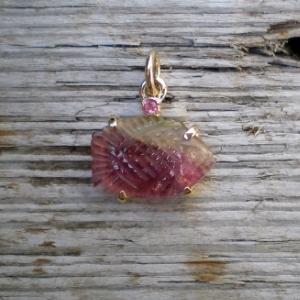 Laura Blanc uses nature as inspiration in her jewelry, often using colored gemstones to highlight her designs; but in this piece the rare carved watermelon tourmaline fish is the star. Tourmaline is sometimes called the rainbow stone because it is found in every color from colorless to black, with pink, green, and watermelon being the most well-known.